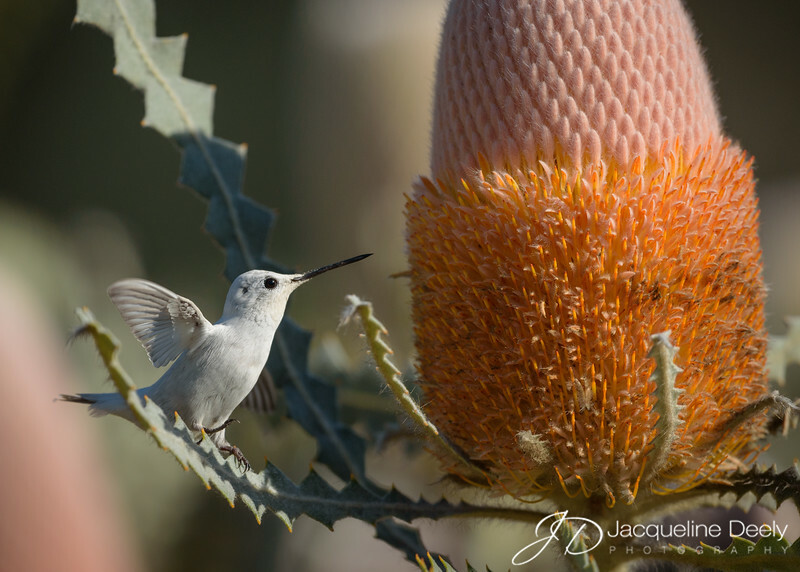 This "leucistic" Anna's Hummingbird is a very rare sight indeed! Here is some info from the UCSC Arboretum website. "According to the California Audubon Society, leucistic birds' feathers are deficient in melanin pigment because they are missing the necessary cells. Albinism is another genetic condition that can turn a bird’s plumage pale, but there are distinct differences between albino and leucistic birds. This bird is not an albino since its bill and eyes are dark and there is some pigment in the feathers - so it looks like a deficiency rather than absence of melanin. The hummingbird’s iridescence is a so-called “structural” color because it arises from reflections and interference of light when structures in the feathers are of similar dimensions to the wavelength of light (500 nanometers) rather than a pigment. However melanin is important if absorbing some of the light so specific colors are reflected. While leucism can be unusual and exciting for a birder to see, birds with the condition face special challenges in the wild. According to the California Audubon Society, the lack of bright color may make a leucistic bird unattractive to mates and at greater danger of being attacked by predators. Lighter plumage may rob the birds of protective camouflage and make them more vulnerable to predators such as hawks and feral cats. Because plumage colors play an important role in courtship rituals, birds with leucism may be unable to find strong, healthy mates. Melanin is also an important structural component of feathers, and birds with extensive leucism have weaker feathers that will wear out more swiftly, making flight more difficult and eliminating some of the bird’s insulation against harsh weather."